I came across a discussion on the Muslim Matters site today regarding the Friday khutba being delivered in the Arabic language. The author unfortunately only cited a general comparative work on fiqh for the Hanafi position, as opposed to researching in the specialized and detailed works of the school. Perhaps he might be unaware that Mufti Taqi Uthmani has a translated work in English which covers this issue thoroughly and has been available for some time. Sidi, do you know of any leaway on this matter? 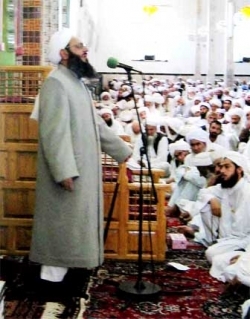 Many asatidhah well versed in the madh-hab have incorporated English into the Arabic Khutbah, such as Sh. Faraz Rabbani, Sh. Muhammad al-Ya`qubi and others, may Allah preserve them all.